His Building Blocks: Goodbye Cable TV, Hello "Mommy School"! Goodbye Cable TV, Hello "Mommy School"! We recently pulled the plug on cable television. We have been wanting to do it ever since we read the book, "Radical" by David Platt about a year ago (an excellent book and must-read for every Christian), but just kept finding excuses not to do it. Our excuses went something like this: "But, it's football season right now," or "But Luke likes to watch Team Umizoomi and Little Einsteins and TV helps me maintain my sanity." Well, we decided we really needed to begin to give up some of the "luxuries" that we had and cable TV seemed like a good place to start. We haven't exactly given up TV completely though. We are currently doing a free trial of Netflix and Hulu Plus. If we continue to subscribe, they only cost $7.99/month, which might be worth it with a toddler around. It is very nice to be able to pull up "Veggie Tales", "Super Why" or "Caillou" whenever I want to "settle Luke down" a bit. Still, we are watching a significant amount less of television than when we had cable, which is definitely a good thing! It is amazing all of the things you can find to do when you don't have cable TV. Something that I noticed this past month about Luke is that when you keep him busy, he behaves very well. When I had the TV on more often during the day and was busy tending to Abbey or the house, time-outs were occurring more frequently. But, since I have been planning more activities for Luke throughout the day, time-outs have seriously diminished and are pretty rare. Luke just needs something to do all the time. So, I have to come up with many activities for Luke each day in order to have a time-out free day. I feel that I am not the most creative person, but I am very resourceful. 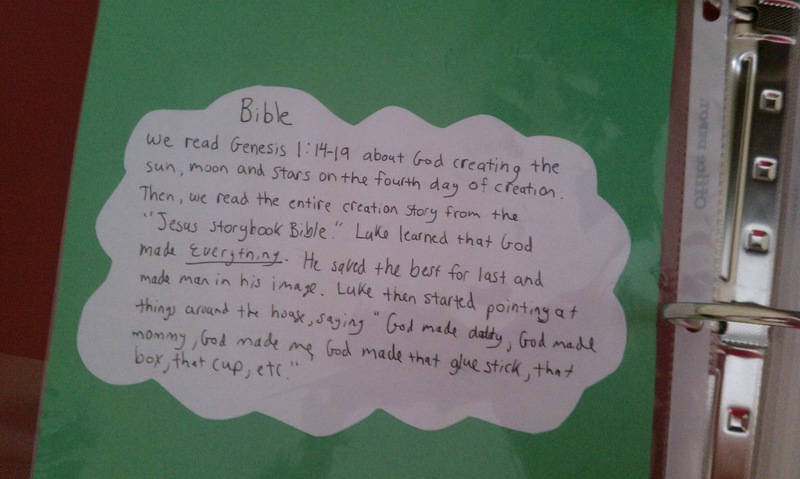 So, I scoured the internet and found the perfect way to create a "curriculum" for Luke that doesn't take very much creativity or time. I am using the "Before Five in a Row" book to create a wonderful curriculum for Luke for Mondays, Wednesdays and Fridays (we call it "Mommy School"). He attends a preschool at a Church on Tuesdays and Thursdays. The "Before Five in a Row" vision statement is "Dedicated to protecting and nurturing the early years of childhood, Before Five in a Row opens up the world of learning through great books and creative play and builds a solid foundation for more formal education to come." Basically, each of the 23 units in the book includes a bible segment, as well as various hands-on learning activity ideas for your child that go along with a classic children's book. The "Before Five in a Row" book just provides some ideas--but I found many blogs that are extremely useful with great activities. My favorites are http://delightfullearning.blogspot.com/ and homeschoolshare.com. Actually, the homeschoolshare site has tons of printables and activities to go along with each of the books. I created a lap book to journal/keep all of the activities we do together. We read the nursery rhyme, "Hey Diddle Diddle" since there is a part of the rhyme in the story (the cow jumped over the moon). We colored various objects and Luke placed them where they go in the rhyme. Luke played a game where we sorted objects that we said goodnight to in the book vs. those that we did not say goodnight to. This was a great memory game. We practiced recognizing our circle shapes by creating an "I Spy a Circle" wheel. This is such a cute book, with great rhythm. It almost reads like a song. We found a fun Melissa & Doug puzzle--you get to dress up mama, papa and baby bear. Luke's favorite activity for the Jesse Bear book was definitely this puzzle. But, the homeschool share site also had a fun game that we printed and he really enjoyed. There were six little bear faces that we colored and then hid around the room for Luke to find. Being so close to Easter and our egg hunts, he has really enjoyed hiding and finding objects. There were many other Jesse Bear activities that we found on the homeschool share site that we did together and he really enjoyed. In summary, I would HIGHLY recommend the "Before Five In a Row" book and online resources! And the great news for us is that after we are finished with this curriculum, there is a "Five in a Row" curriculum to follow (for ages 4-8). We are having so much fun with this and I like that it only takes me a few minutes to prepare each day. I definitely don't have time to spend creating these lessons from scratch.